This is even worse on mobile implementations – with both limited screen size and a (very) high converting device (a phone) being overruled by the obnoxious chat box. Don’t get me wrong, chat works – just pick your vendor very very carefully. But that may all change on January 10th. Google has announced a penalty on sites implementing intrusive interstitials (those annoying pop up chat boxes would fall into this category). While chat isn’t specifically called out, the announcement does describe the concerns; including interstitials that cover the main content as they “provide a poorer experience to users than other pages where content is immediately accessible”. Google very specifically calls this out as a SEO penalty for mobile – those types of pages “may not rank as highly”. 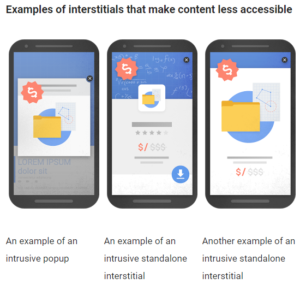 While Google has said “responsible interstitials” may remain – based on their description, I read the tealeaves as meaning chat pop ups that very quickly and aggressive cover content and all other forms of conversion most likely will incur an SEO penalty for mobile based searches. I’m a bit late to the game here but as soon as Ngage heard the news about this penalty, we began developing and split testing several different alternative approaches to the chat invitation. After several different prototypes, several iterations upon each prototype, and millions of visits worth of split testing, we’ve created some options that are fully compliant with Google’s new requirements but still convert at the high rate that our clients expect. PS. Any live chat vendor who positions their product as a “marketing channel” is kidding themselves and you. Chat is a conversion tool, it does nothing if you don’t already have high quality traffic to your site. It’s not a magic wand; if you have bad or no traffic, chat won’t change that. All it does is convert more of the traffic that you already receive. To clarify; when I say “late to the game”, I mean in replying to this comment. We began working on these new designs back in August when the news broke.